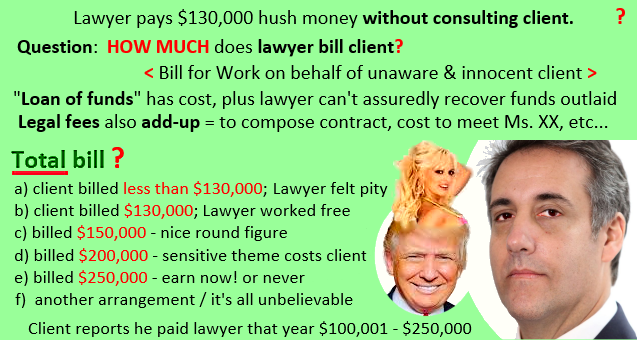 Lawyer-to-the-Stars, Michael Cohen, reportedly paid a lady the amount of $130,000 to say nothing about his client's unadmitted sexual encounter. Client Donald Trump reportedly was oblivious to the transaction. 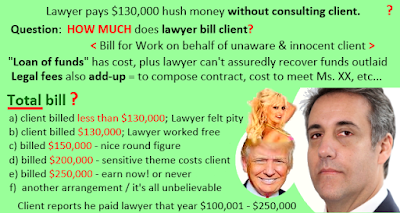 Lawyer paid with his personal funds, and secured a signed contract promising future silence. Trump denies ever schtupping Ms. Stormy Daniels. Trump denies managing the hush-money payoff. Trump has now belatedly admitted compensating Cohen for the payoff.